My latest gadget arrived today, and since I'm still waiting on the Kindle Fire to arrive I thought I'd post a few notes. I have my hands on what has to be the oddest devices anywhere. It's a little difficult to describe, because the device it closest resembles is the Kindle, only this tablet has the keyboard on the long side of the screen, not below the short of the screen. In a pinch you could say that this tablet was the result of a drunken one night stand between a Blackberry and the Playbook. The resulting child was then put up for adoption, and that's why it is running Android. When I bought this, I expected it to be a poorly conceived device that had a stock Android firmware installed before being sold to the unsuspecting public. 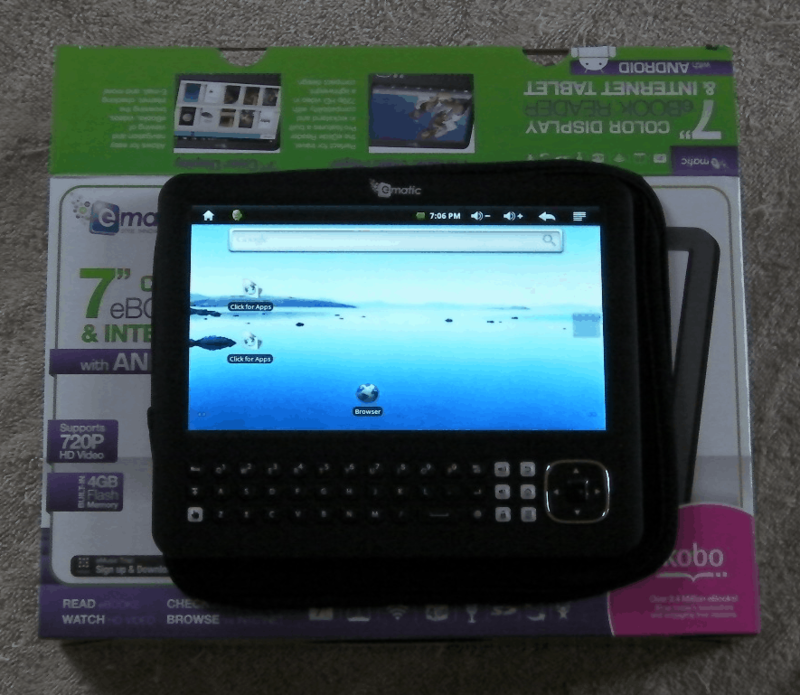 I've seen an Android netbook that fit that description and that's what I expected with the eGlide. I am at least slightly wrong; the eGlide was better designed than I thought. The general feel of the eGlide is not bad. It's not a premium tablet by any measure, but it is solidly made. It's a tad on the hefty side when compared to current ereaders, but it's also a little lighter than most 7" Android tablets. I've covered the specs before, so I won't repeat them here. But let me fill in a few details that aren't mentioned anywhere and can't be seen in the picture. It doesn't have a touchscreen, unfortunately. That means you're stuck with the d-pad to navigate around the menus. But on the plus side that isn't a standard d-pad; the center is an optical trackpad, not a button. Swiping the optical trackpad will move the cursor around the screen. It's not as good as a touchscreen, but it's a darn sight better than nothing at all. Now, the eGlide is running Android v2.1, and that means there's a lot of activities that can only be done with the touchscreen. Fortunately the developer planned for that and included several extra buttons as well as some tweaked drivers. There's an unlock button. There's also a button in the bottom left corner that you can use in combination with the optical mouse to select icons on the screen. I've been using it for about an hour now and I'm really beginning to appreciate that the developers put some serious thought into the design. I'm not sure if it's great, but all in all, the eGlide is quite usable. The speaker on the back is rather quiet. The headphone jack on the lower edge is slightly louder, but there's no risk of hearing loss. The overall audio quality is acceptable, but the video quality has issues. I tried it with a fairly ordinary 350x650 AVI file, and it was at times both sharp and fuzzy. I'm not sure why the quality dropped at times but it did. BTW, there's a kickstand on the back which you cannot use properly if you're also using the headphone jack; the eGlide will be propped up at a weird angle. It doesn't come with anything spectacular in the way of apps, but the eGlide does come with the basics: file manager, email, browser, an ebook app, and Kobo. It should fill your basic needs right out of the box. I've somehow managed to make it freeze so I'm going to cut the review short here. But I have to say that I have a good feeling about this tablet. It's definitely worth a second look. The most common versions have both touchscreens and membrane keyboards and look like something V-Tech designed but are oil- and waterproof and built to withstand industrial punishment. I should have known about those WinCE devices. Interesting. Did this form factor ever get a name, do you know? Don’t even remember if I kept any copies of those early PEN COMPUTING issues. But that’s where I saw them.